Perfect for Monday night, this is a super healthy dish to make up for all of the excesses of the weekend. It’s also ready in less than 10 minutes – bonus! The sauce contains both rocket and watercress, which are packed full of vitamin C. Watercress is so healthy that Hippocrates chose the spot for the first ever hospital (we visited the ruins on our honeymoon in Kos) next to a river so that there would be a ready supply of it. 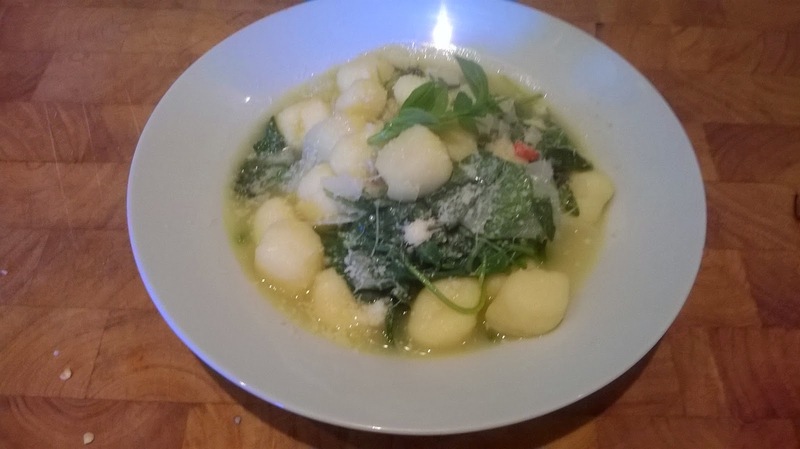 This recipe also has gnocchi, wine and lashings of parmesan – so it’s not completely angelic, but it is dead tasty! 1. Chop the onion, garlic and chilli and pop into a high rimmed saucepan with the olive oil. Sizzle for 2 minutes until the onion has started to soften. 2. Tip in the wine and water, bring to a simmer and add the gnocchi. 3. Cook for 3-4 minutes until the gnocchi is almost done (press a piece with your finger – if it’s soft and pillowy it’s perfect). 4. Add the rocket, watercress and basil and allow to wilt, then turn off the heat. 5. Serve under a mountain of grated parmesan!